Stepping down after nearly two decades as OU’s senior vice president and provost, Dr. Nancy Mergler is preparing for possibly the most significant transition of her career — being able to sleep at night. In a spare moment, Mergler spoke with Assignment Radio’s Molly Evans about concluding the 19-year chapter of her professional life, starting as the only female provost in the Big 12 in 1995 and ending as the longest-running chief academic officer in June of this year. Nancy Mergler tells Assignment:Radio's Molly Evans about her time as president and provost and how it feels to be stepping down. The campus bells are ringing in 11 o’clock on a Wednesday morning — a sound Dr. Nancy Mergler knows well from her office in Evans Hall, which sits regally at the top of the North Oval. Although the melodies of OU’s alma mater and state anthems will not have the same boom come summer, Mergler will still hear the familiar tunes further south of the bell tower when she returns to the Honors College during her sabbatical in the fall. 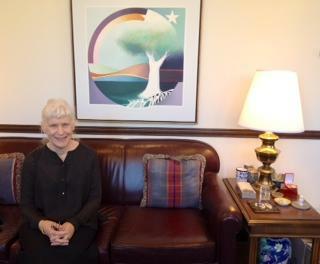 In her spacious, first-floor office illuminated by large windows, decorated with historical photos of campus and furnished with a plush, leather couch, Mergler details her acceptance of the position of senior vice president and provost in 1995 when David Boren had been president of the university for just one year. "I was called in to meet with President Boren in his office, and I thought he wanted to discuss something about the honors program, so I was stunned," Mergler said. "I was a dark horse candidate to be the provost, but he appreciated that I had had the opportunity as director of the honors program to know many of the very best teachers on campus, many of the young faculty and certainly many, many of the student leaders." Mergler explains what it meant to be the only woman provost in the big 12. "I was the only woman in the Big 12 amongst provosts, so I can remember my first provost meeting," She said, "I’m there. You just walk in and say, “OK, I belong here. It’s OK. I feel a little different.” But they made me feel welcome. These days about half the provosts in the Big 12 are women; it’s become a nonissue. That’s exciting for me to see that transformation, but it’s really happened in the past two decades." She says she feels excited about stepping down. "I feel good about it," She said, "One of the things that this kind of position brings with it to the individual holding it is an overwhelming amount of responsibility and stress. I have wonderful, talented deans, chairs and directors that do the good work, but what resides at my desk in a kind of Truman-esque way is that stress and worry about changes and getting people ready for accreditation or compliance or regulations, making sure we’re adopting the technology and making good decisions about how we’re spending our money. And I’m looking forward to teaching myself how to sleep through the night without having to worry." Mergler says she wants to have a positive legacy. "First of all, I’m working to make it a very smooth transition, so that the Norman community doesn’t feel disrupted by it." She said "I’ve been working with my senior vice provost on all of the just basic processes, and I also hope people will think fondly of me as trying to have been a good steward for the entire Norman campus and make good and fair decisions for the students and the faculty and the staff. And that by and large, I think any provost has to make some decisions that will not please everybody, but I hope people will remember as coming to those decisions in a reasoned, deliberative way and wish me well, or wish me well as I learn to teach with your generation again." Mergler has a lot of plans for after her role as president and provost. "I’m going to be developing some courses on my sabbatical that will be offered down in the honors college." She said. "One of things I want to do in the fall is sit in on some courses that other faculty in the honors college are teaching to get a better sense of your generation of students. I also want to visit my adult children. I went to administration in the honors program when they were 2 and 4, so they’ve only really known a mother that’s kind of a frantically busy administrator, so I want to visit them. I want to travel some with my husband, just as a tag along not for professional travel. Very much looking forward to that." Mergler laughs when she is asked if anything could make her come back. "You gotta be kiddin’ me," She said "I laugh. I have this big grin on my face, and I think it’s definitely time to pass on that role to others, so I think I’m done with that. I’m always available to anybody for mentoring or questions or “Where is it?” but no I don’t think I’d be lured back in. No way." Although Dr. Mergler is confident in her decision to step down from provost, ending a 19-year career, she mentioned one thing she could have done better. "I think it’s important at these transition times to say thank you to everybody I have had the opportunity to work with," She said. "All these people working so hard to make the university absolutely splendid. I regret not having told them more often how deeply I appreciate their efforts." Dr. Mergler told Molly the provost office was just getting used to fax machines when she began, and now, 19 years later, she’s wading through massive, electronic archives as she prepares to conclude her time as provost and re-enter the classroom of the digital age. For a Mergler’s full biography in higher education, visit K-G-O-U dot ORG.